This page created 22nd February 2006. Boro'line Maidstone was another bus company which sought to make money out of London tendering, despite being based well outside the capital. 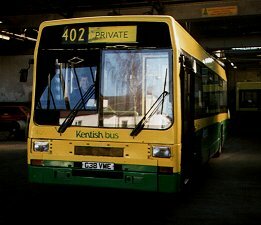 In 1987 it gained a pair of peripheral Kent County Council contracts - for Friday and Saturday evenings, plus Sunday, on the 22 (old 402 route: Bromley-Tunbridge Wells), and the 26 (Sevenoaks- Kemsing loop). I suspect that they used their three new Lynxes (227-229) on these operations. The 22 contract was renewed in 1988. The three Lynxes were painted in Boro'line's bright yellow and blue livery, with red stripes and yellow doors. In January 1988 Boro'line started London operations, using new Olympians (once they arrived), on the 228/328. The Maidstone-based company set up a base in Crayford from which to operate its London business. Bexleybus, the low-cost London Buses unit that had been shoved into partially re-opened but decrepit Bexleyheath garage with a motley collection of new and old buses for tendered operations was a fairly obvious target for Boro'line, as Bexleybus' disaffected and reduced pay staff were not sufficient to provide a reliable service. (Such were the wondrous early outworkings of the 1985 Transport Act). 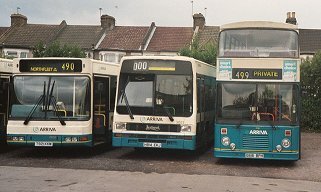 In January 1988 Bexleybus gave up the 132 route, which Boro'line snapped up, and in November the 422 and 492 followed. Boro'line worked its Lynxes hard, and acquired secondhand Nationals to plug the gaps. Boro'line stepped on the tendering accelerator, taking on the 188 (Greenwich - Euston) with new buses, and the 108 (Wanstead - Blackwall Tunnel - Lewisham). For the latter Boro'line acquired another dozen Lynxes (801-12), which arrived in October 1989 for Boro'line to take up the 108 in November. These were different from the earlier buses in having a stepped floor (a step up in front of the rear axle) instead of a ramped floor. The new buses, plus the new Volvo Citybuses for the 188 (once they arrived), went into a new depot at Greenwich. 1990 had not been such a good year for Boro'line. LRT tendering wasn't as straightforward as it seemed. Public dissatisfaction with some operations saw them lose the 188 retender to Selkent. Older buses had caused problems too, and the Lynxes had appeared on the 228/328, 233, 422 and 492 as well as on their scheduled 108. The scheduled Nationals on the 492 (ex London LS) were becoming tired, and Boroline ordered a further four step-floor Lynxes to replace them from January 1991. By the end of 1991 the cracks were showing in Boro'line's financial performance. The costs of lots of new buses and south-east London operating costs were not being matched by the tender and fare receipts. Maidstone & District and Kentish Bus forebore from buying the company outright, thereby assuming its debts. Eventually they bought its buses and services between them. Kentish Bus was not a total stranger to the Lynx. It had used a demonstrator for a week in December 1988, managing to squeeze operation from Northfleet, Swanley and Dunton Green into five days! The oldest three of the Boro'line Lynxes, with ramped floors, were scheduled for its "Country Area" operations, soon going to Dunton Green. The "London" sixteen remained doing what they were bought for: the 108 and the 492. Gradually they acquired Kentish Bus primrose and maroon livery. The Crayford base was left, with the Lynxes from there going into Dartford. Those for the 108 operated from a more convenient base, with less dead mileage, at Lewisham. When the 108 contract passed on a new contract was found for the displaced Lynxes. The North London Line railway was being blockaded for the extensions to the Lego line and the Jubilee Line, requiring a bus service between Stratford and North Woolwich. A fleet of Lynxes and Atlanteans was hired from Kentish Bus, and painted in a blue, white and grey livery for the job, starting in May 1994. For this contract the ten Lynxes were allocated to Cambridge Heath garage: the new but closed Ash Grove garage, leased by Kentish Bus. The Lynxes not required for the railway contract found other work at Dartford and Dunton Green. They were joined at the end of 1995 by the off-contract buses. There was a measure of dispersal, with some going to Londonlinks at Beddington Farm to join their ex-London & Country fellows on the 289, and some going to neighbouring Maidstone & District. 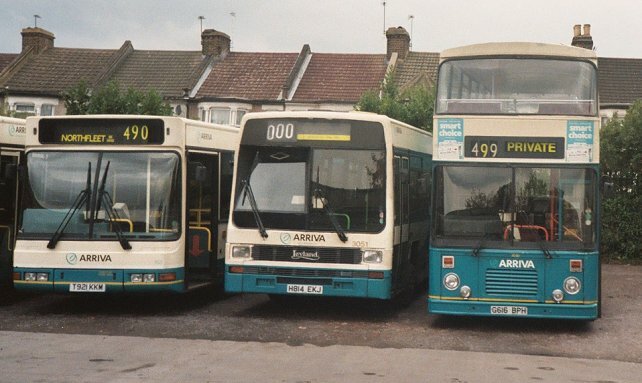 From September 1996 part of the 228 was replaced bty the 233 (Eltham - Swanley) and Lynxes appeared here. They also worked alongside Greenways on the 227 (Crystal Palace- Bromley). A new livery for Kentish Bus country operations was introduced, of green and yellow, which looked good on all its recipients, including the Lynxes. 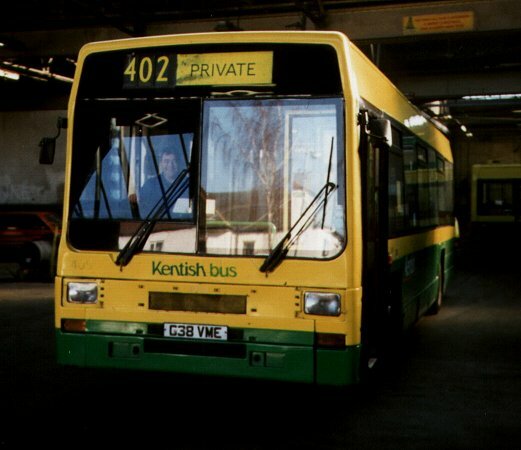 405 was in Dunton Green garage on the garage's last day of operation in February 1998. Here it is seen ready to depart for its new home. Over the next few years the Lynxes went elsewhere. The London contracts had gone elsewhere, or used newer low-floor Darts, and Arriva Kent Thameside had little use for full size single-deckers on its "Country" operations. Nearly all the Lynxes went, to Arriva Cymru and Arriva Kent & Sussex mainly. But Northfleet had a continuing need for one or two (a schools contract? ): 413 (latterly 3053) fitted the bill until spring 2002, when it met its end in a chemist's shop in Longfield whilst on loan to Dartford. 3058 had a spell from November 2002. 3051 returned in February 2003. By this time Arriva's turquoise and cream was the order of the day. Other buses were swapped between Northfleet and the Medway Towns as required. In July 2004 3046 arrived - a Lynx that had not been here before, but from Maidstone & District via Arriva Kent & Sussex. 3051 rests in Northfleet yard in October 2004, between DAF 3921 and Volvo Citybus 7616. Now that there were three Lynxes again at Northfleet they began to appear quite frequently on the trunk 480/490 routes and the 423, alongside much more modern rolling stock. Ian's Bus Stop LX Contents. BusLines. Jubilee, County, The Shires.